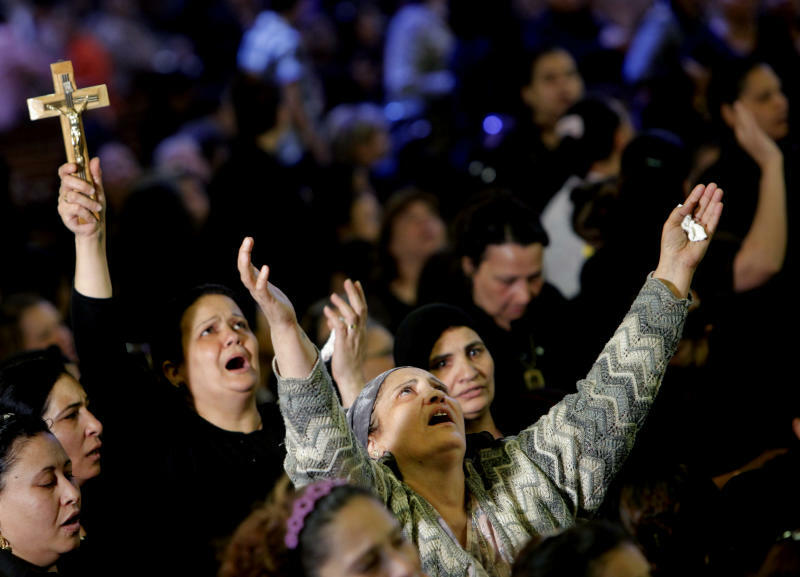 CAIRO (AP) — Christians angered by the killing of four Christians in weekend sectarian violence clashed Sunday with a mob throwing rocks and firebombs, killing one and turning Cairo's main Coptic cathedral into a battleground. The clashes raised tempers in an already tense political atmosphere, as workers shut down the country's trains in a strike over wages and a dispute over the nation's chief prosecutor entered a new phase — all signs of two years of unending turmoil. Reacting to Sunday's violence, the Muslim Brotherhood's political party blamed "dubious" attempts by unnamed parties to broaden instability in Egypt by igniting sectarian violence and spreading chaos. A liberal opposition group, the Popular Current, said the clashes were symptomatic of the failure of the state to protect its citizens, calling on Islamist President Mohammed Morsi and his government to resign. Morsi said in a statement late Sunday that he spoke to Pope Tawadros II by phone. He gave orders to authorities to guard the cathedral and citizens in the area, adding that protecting the lives of Muslims and Christians was a state responsibility. "I consider any attack on the cathedral as an attack on me, personally," he said, according to the statement from his office. 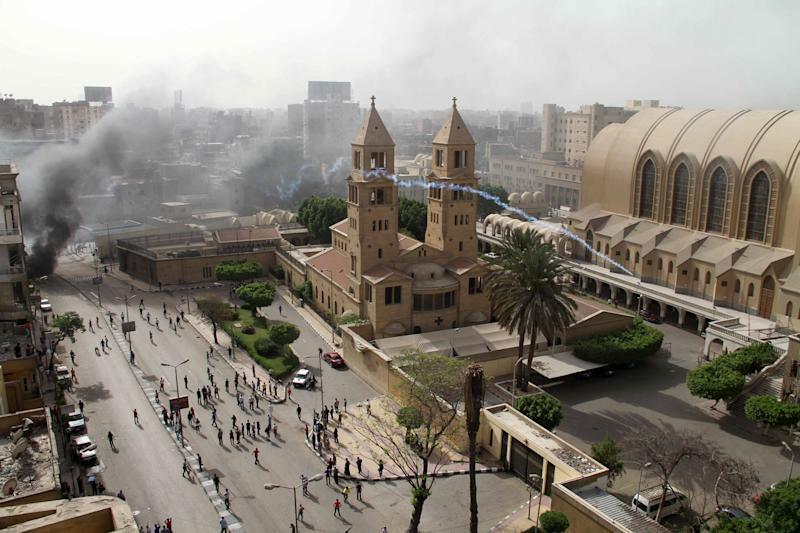 The clashes at the St. Mark Coptic Orthodox Cathedral began just after hundreds of angry Christians left the complex to stage an anti-government march following the funeral for the four Christians killed in sectarian clashes Saturday. A mob, described by witnesses as residents of the area, pelted them with rocks and firebombs and fired birdshot, forcing them back inside the complex. Few police were present. By the time police arrived in larger numbers, the church was the scene of clashes between those locked inside and the mob outside, as the two sides exchanged rocks and firebombs. Police fired tear gas, and gas canisters landing inside church grounds caused a panic among women and children. People outside the church cheered. Tawadros was not in the cathedral, his headquarters, during the funeral and the violence that followed. In a statement carried by the state news agency, said he was "regretful" of the violence and called for calm. "There was no security outside the church for such a large funeral," said Emad Thabet, a Coptic Christian who was among those locked up in the church for hours. "There is no such thing as Egyptians in Egypt. There are only Muslims and Christians," he said. 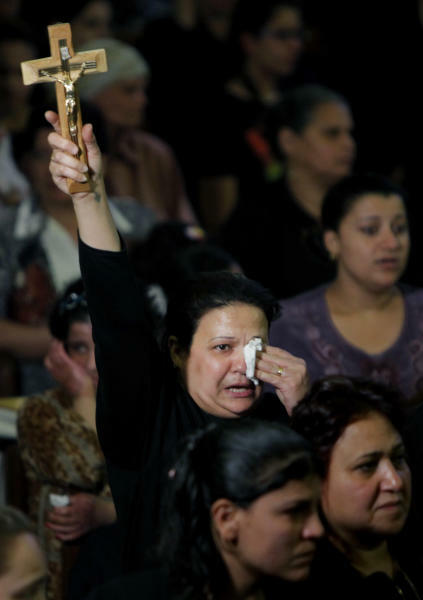 Copts have complained for decades that the Christian minority suffers from discrimination. Coptic Christians make up about 10 percent of Egypt's estimated 90 million people. Attacks against Christians have increased since the ouster two years ago of autocrat Hosni Mubarak. The clashes took place alongside a development in another of Egypt's many crises — questions surrounding the legitimacy of the country's top prosecutor. On Sunday, Egypt's highest judicial body urged him to step down less than five months after Morsi appointed him. A few days earlier, a court ruling declared his appointment void. The statement from the Supreme Judiciary Council urged the chief prosecutor, Talaat Abdullah, "to express a wish" to return to his previous job as a judge for the sake of the unity of the judiciary. There was no immediate comment from Abdullah. Officials in his office and in the government indicated before that he will appeal the court decision. Abdullah's appointment in December set off demonstrations and protests by judges and fellow prosecutors. The protests forced him to tender his resignation, but then he withdrew it and stayed in office. Removing Abdullah has been a key demand of the mostly liberal and secular opposition. Sunday's call by the council of the judiciary appeared aimed at offering him an honorable exit, a step toward ending the long-running crisis within the judiciary over the appointment. During the past two weeks, Abdullah has issued summons against several media celebrities critical of Morsi, Egypt's first freely elected president. They included popular TV satirist Bassem Youssef, who was accused of insulting Morsi and Islam. The satirist was released on bail. Alongside the sectarian and legal issues, the overriding economic crisis flared as Egypt's railway services came to a halt Sunday because of a strike by train drivers and conductors demanding better pay. The strike snarled inter-city transit, and thousands of angry passengers crowded train stations. The most immediate issue was the specter of sectarian violence increasing and spreading to the rest of the country. Sunday's clashes grew out of Khossous, a town north of Cairo, where five people, including a Muslim, were killed a day earlier. Renewed clashes erupted there later Sunday outside the local church, leaving 12 residents and one police officer injured. At the cathedral on Sunday, witness Ibrahim Elsherif said the clashes began when angry Coptic protesters tried to stop traffic for an anti-government march. A street brawl turned quickly into an attack by local residents, who pelted the protesters with rocks from the roofs of nearby buildings, throwing firebombs and firing birdshot, he said. Some protesters smashed parked cars. One Coptic Christian was killed in the violence, and at least 66 people were wounded, the Health Ministry said. Two local journalists were among those injured, one seriously, according to their newspapers. Video aired live on the private ONTV network showed young men on the roof of a building next to the cathedral firing handguns toward the compound. Inside the cathedral, several thousand mourners chanted slogans against Morsi, calling on the Egyptian leader to step down. They shouted "Leave!" and "This is our country, we will not leave."